This sheet of paper is 8 1/2" x 13". It's a piece of off-white 20# bond with a watermark of BERKSHIRE / SOUVENIR BOND / USA. It has a small rectangular piece of paper, on which is written "Original" in pencil, folded over the upper left corner. 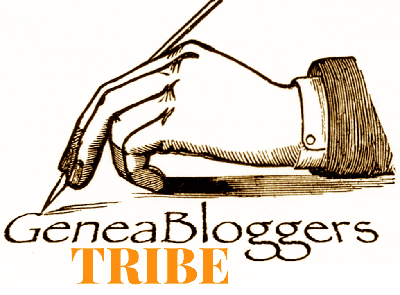 This page is followed by eleven others on the same type of paper. They are backed by a rectangular piece of an advertising poster, which appears to have been cut down to size for the purpose of backing these pages. 1856: John Schafer bought lots 9 and 10. 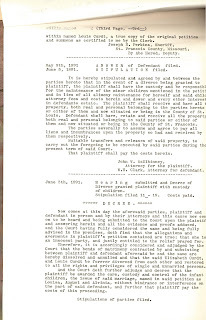 1864: A warranty deed was executed for lot 9. 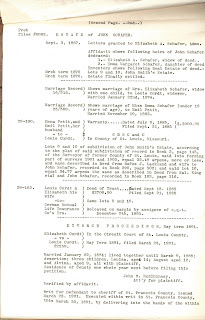 The property was released on margin October 19, 1867, six weeks after letters of administration were granted to Elizabeth Schafer to handle her deceased husband's estate. 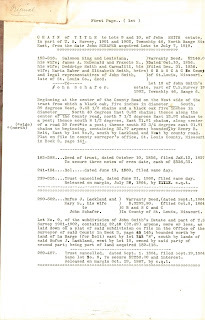 1870: John Schafer's estate was settled. 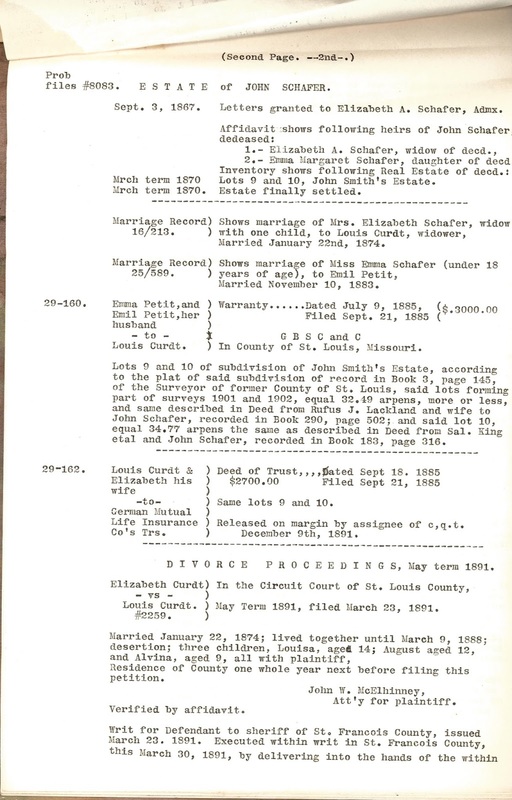 1874: Louis Curdt and Mrs. Elizabeth Schafer married. 1883: Emil Petit and Emma Schafer married. 1885: Emil and Emma Petit's waiver was filed. 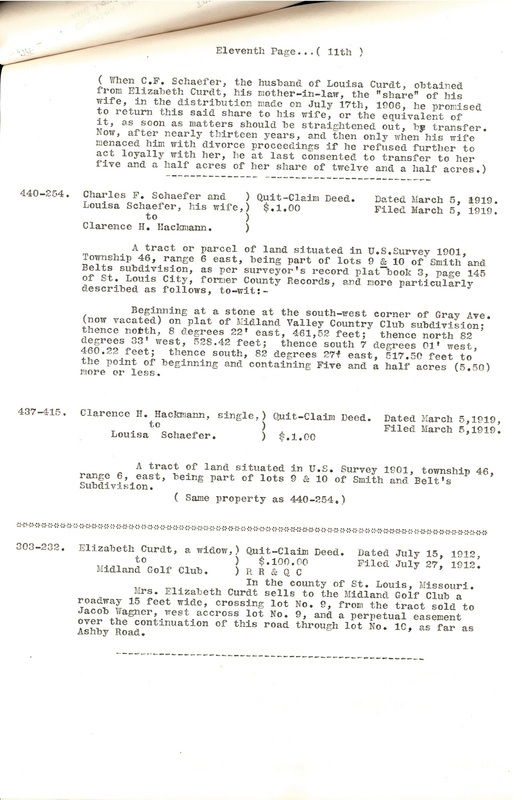 1885: Louis and Elizabeth Curdt filed a deed of trust on the land with a life insurance company. 1891: Elizabeth Curdt divorced Louis Curdt on grounds of desertion. She was awarded custoy of Louisa, August, and Alvina and ownership of lots 9 and 10 but received no alimony. 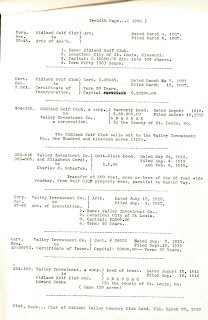 1891: Louis Curdt filed a quit claim on the two lots. 1891: Elizabeth Curdt took out a $2,800 mortgage on the land. She paid it off in 1895. 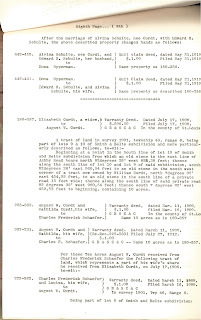 1892: Elizabeth Curdt leased some part of the land for two years to C. W. Seidel. 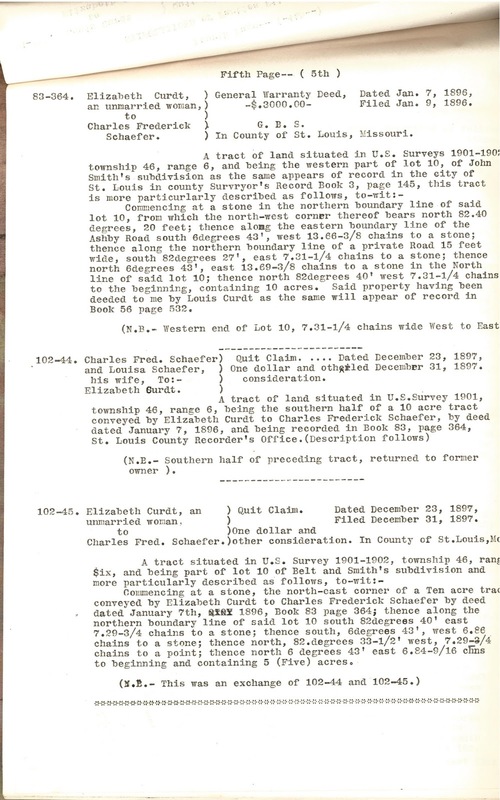 1896: Elizabeth Curdt deeded part of lot 10 to Charles Frederick Schaefer (Louisa's husband), apparently for $3,000. 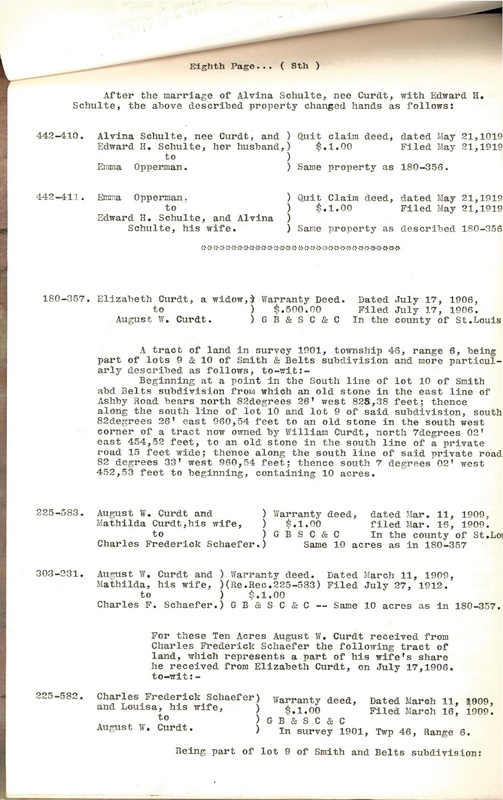 1897: Charles and Louisa Schaefer filed a quit claim to Elizabeth Curdt for half of the property deeded in 1896. The amount is $1 and "other consideration." 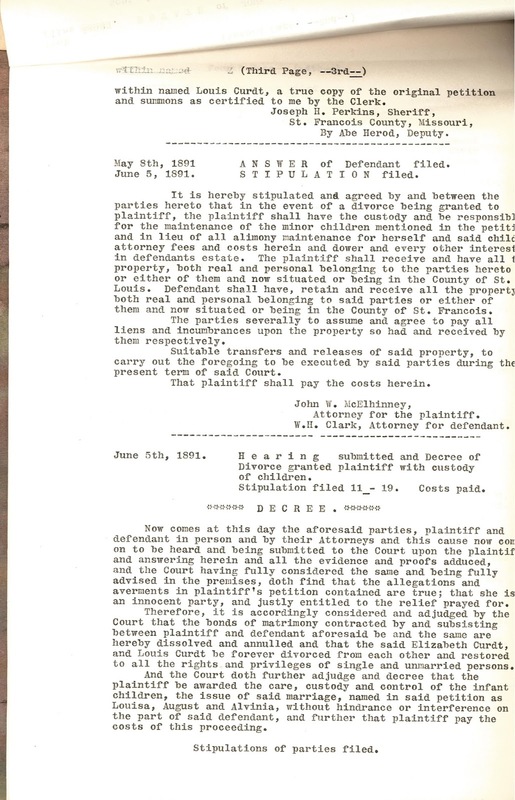 1897: Elizabeth Curdt filed a quit claim to Charles and Louisa Schaefer, also for $1 and other consideration, to exchange property. 1898: Elizabeth Curdt took out a mortgage for $2,800. She paid it off in 1900. 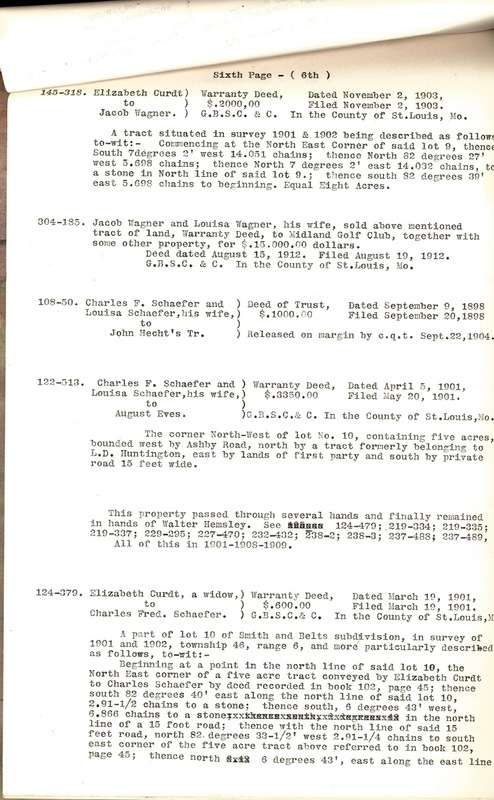 1898: Charles and Louisa Schaefer took out a mortgage for $1,000. It appears to have been paid off in 1904. 1900: Elizabeth Curdt took out a mortgage for $1,500. She paid it off in 1903. 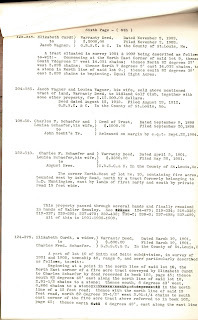 1901: Charles and Louise Schaefer sold part of lot 10 to August Eves for $3,350. 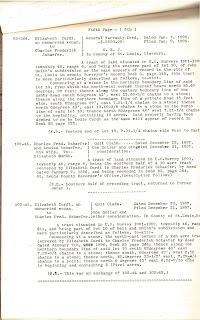 1901: Elizabeth Curdt sold part of lot 10 to Charles Schaefer for $600. 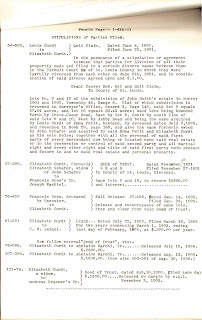 1903: Elizabeth Curdt sold part of lot 9 to Jacob Wagner for $2,000. 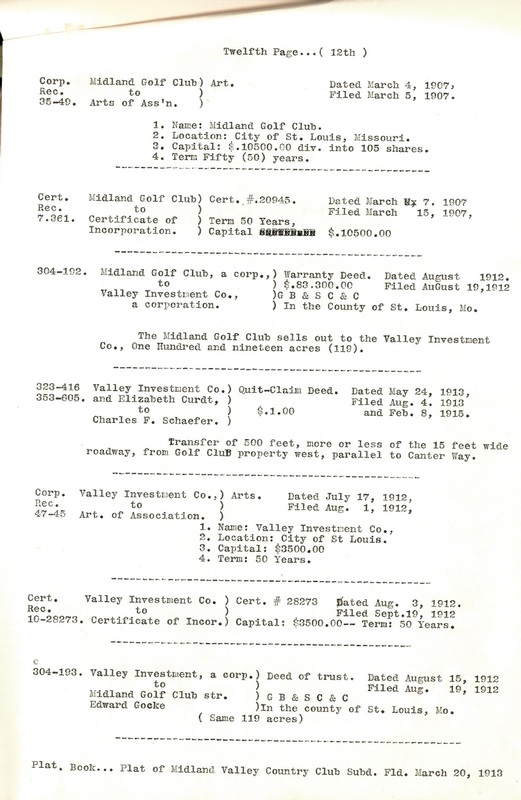 In 1912 Jacob Wagner and his wife, Louisa, sold the land for $15,000. 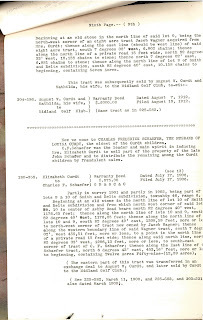 1903: Elizabeth Curdt sold part of lot 9 to William Curdt (a relative of Louis?) for $1,300. 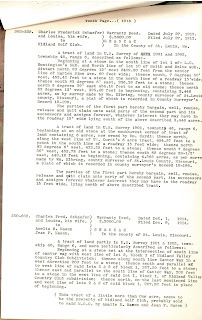 In 1912 William Curdt and his wife, Katarine, sold the land for $5,500. 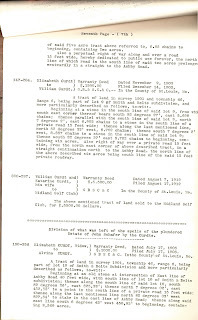 1906: Elizabeth Curdt sold part of lot 10 to her daughter Alvina for $1,000. In 1919, after Alvina had married, she and her husband, Edward Schulte, sold this for $1 on a quit claim deed to Emma Opperman. 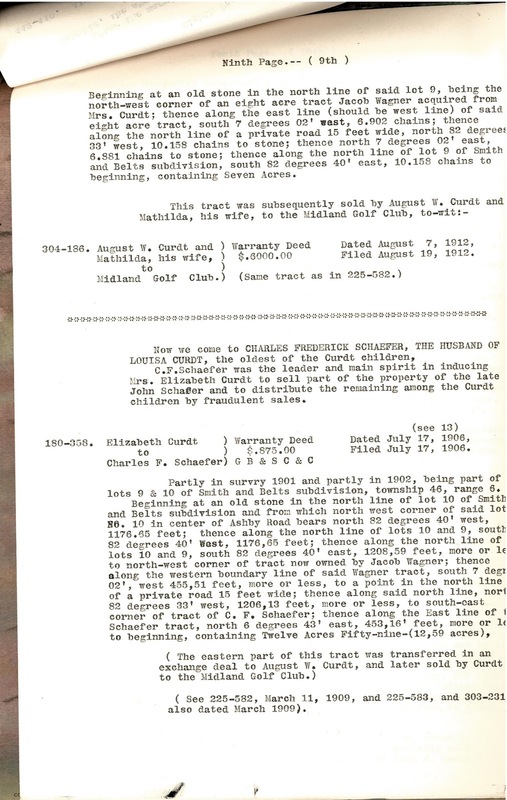 1906: Elizabeth Curdt sold part of lots 9 and 10 to her son, August Curdt, for $500. 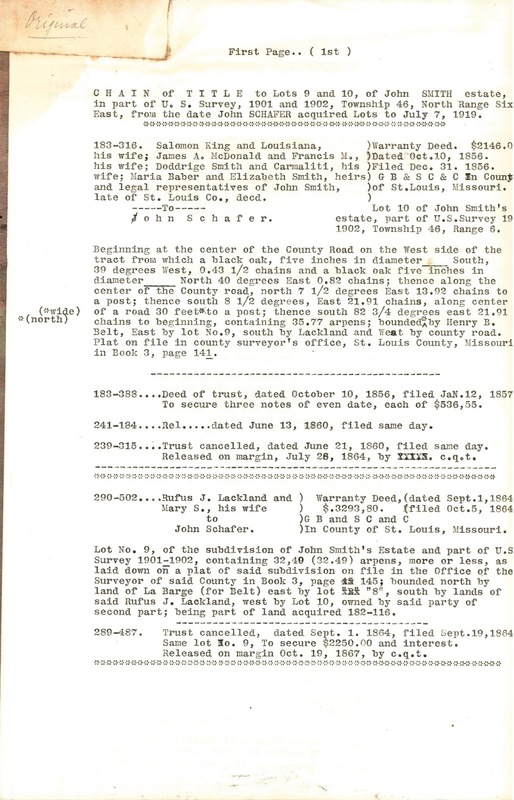 In 1909 August and his wife, Mathilda, sold the property to his brother-in-law Charles Schaefer for $1 and part of the land Charles and Louisa Schaefer received in 1906. 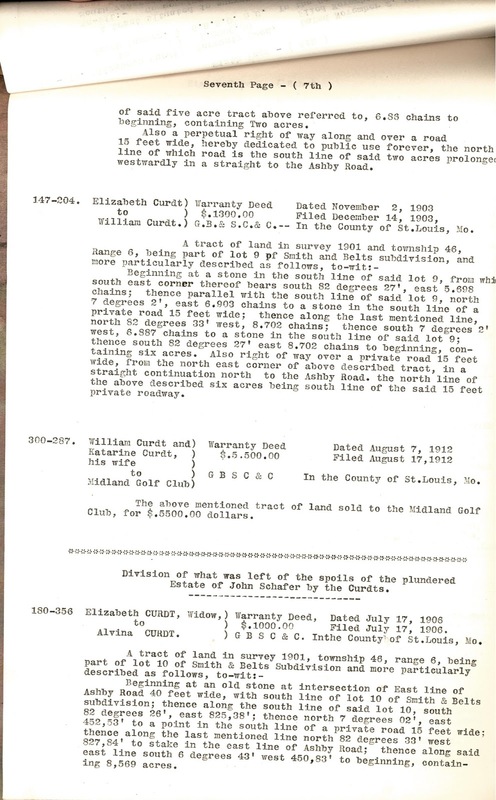 August and Mathilda Curdt sold this second piece of land in 1912 for $6,000. 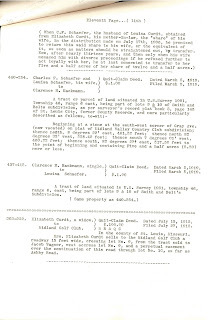 1906: Elizabeth Curdt sold part of lots 9 and 10 to Charles Schaefer for $875. 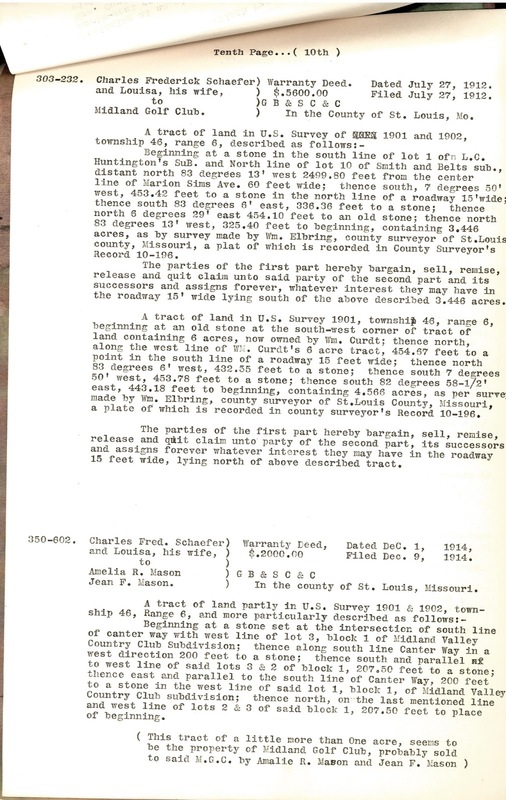 In 1912 Charles and Louisa Schaefer sold part of this land for $5,600. In 1914 they sold an additional section for $2,000. 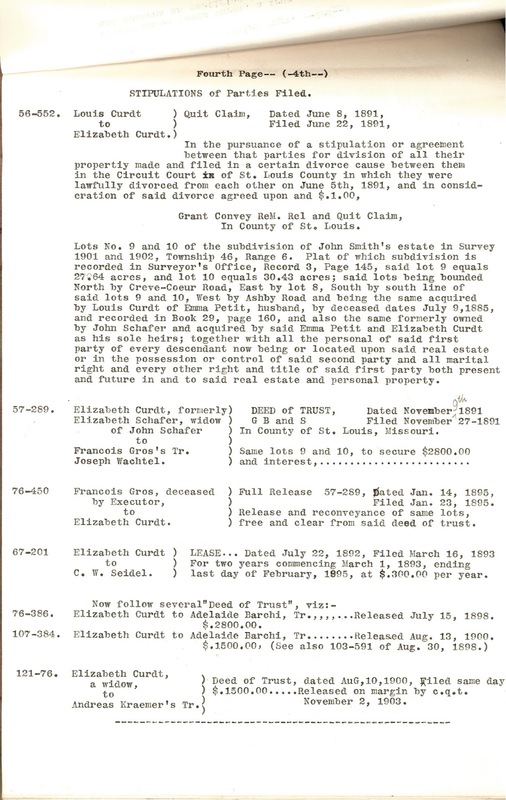 1912: Elizabeth Curdt sold for $100 a small easement adjoining property she previously sold. I can see from this how one could interpret the sales and resales as ripping off Elizabeth Curdt. Playing devil's advocate, however, it could be that the land had simply appreciated quite a bit due to development in the interim between Elizabeth selling the lots and the children reselling them. It also could be the case that Elizabeth was being generous with her children. It's obvious from previous documents that Jean and Emma believed she was being taken advantage of. I don't think I see enough evidence here of that, though.